Spring showers. I love rainy weather. My Grandma called to tell me that my Grandpa was released from the hospital!! I am SO relieved and grateful for that. A long overdue catch up with a good friend. Girl time always makes me happy. We decided at the last minute to go home for the long weekend to celebrate Grandpa coming home. My sister Tia was down from Manitoba as well. We had a big family supper on Sunday and watched the Yorkton Terriers win the RBC Cup. I admit I wasn’t super interested until the last half but that game was crazy! It was pretty exciting to see a small town like ours in such a big event. While home, we stopped at my favorite seasonal ice cream shop in town. They make my favorite sundae ever, which I’ve loved for years. It’s called “A Moment on the Lips”. 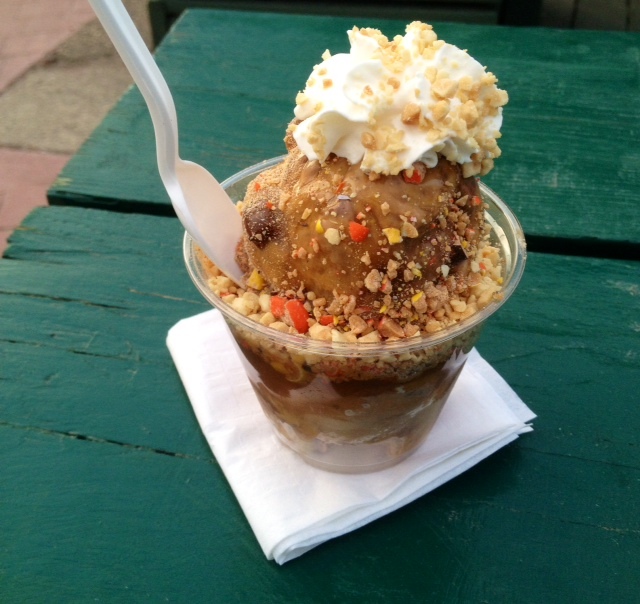 Rolo ice cream, butterscotch sauce, salted peanuts, crushed Reese’s Pieces and whipped cream. Seriously, the best thing ever. See above for proof. I got a rhubarb plant! I cannot wait to have fresh rhubarb at my disposal. It should be noted that I still have to plant the thing and not kill it. Stay tuned. The long weekend totally recharged me. Why can’t every weekend have three days? !